Product prices and availability are accurate as of 2019-04-18 23:28:05 UTC and are subject to change. Any price and availability information displayed on http://www.amazon.com/ at the time of purchase will apply to the purchase of this product. Steam distilled from the wood of the Atlas Cedar tree, Cedarwood Atlas Essential Oil is a well known essential oil and has been used for centuries. This 100% pure, undiluted oil with absolutely no additives or fillers has a rich, woody aroma with a hint of spicy and sweet that will remind you of an antique cedar chest. This familiar aroma can help create an atmosphere that is positive and calming; a welcome atmosphere amongst all the chaos and negativity we face each day. This wonderful essential oil is known for its therapeutic properties throughout the oil world. Used to help support a healthy respiratory system as well as a healthy, flake-free scalp, t is also a favorite to use in a blend to keep outdoor annoyances at bay, so you can enjoy your outside nights longer. It can also be used on special nights to help set the mood. 100% PURE ESSENTIAL OIL: Steam distilled from the wood of the Atlas Cedar tree to produce a high-quality essential oil with absolutely no additives or fillers. CREATE A POSITIVE, CALMING ATMOSPHERE: Add a few drops to your Plant Therapy Aromatherapy Diffuser, personal inhaler, or diffuser necklace to help promote a positive and calming atmosphere. SUPPORT A HEALTHY, FLAKE-FREE SCALP: To promote a healthy, flake-free scalp, add a few drops of Cedarwood Atlas to your favorite shampoo and use as directed on your shampoo bottle. BATCH SPECIFIC GCMS: Every bottle of oil that you purchase from Plant Therapy goes through multiple rounds of testing including organoleptic testing by Robert Tisserand and multiple rounds of GCMS testing by several third-party laboratories. Look for the specific batch code on your bottle! HAVE QUESTIONS? 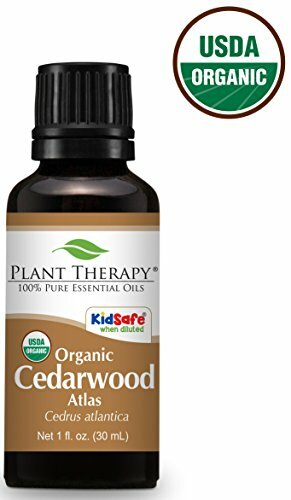 : Plant Therapy's certified aromatherapists are happy to help you with your Cedarwood Atlas Essential Oil questions via Amazon Messages. We welcome your questions and input!